As they say, many hands make light work. In 2011, Jo Pearson and Jess Soutar got together and founded Coco and Co, a Hastings based store selling the work of over thirty makers from all over New Zealand. Coco and Co is all about making a contribution to the community through collaboration, collective construction and consideration… hence the name! Both ladies will be joining in our creative takeover of the capital this Queen’s Birthday weekend to teach their workshop Hexagonal Fattie Cushion. Focusing on recycling and sustainability, this workshop will breath life back into those big old woollen blankets hiding in your cupboard and turning them into cushions perfect for the home. We caught up with Jo to find out just what ignites her creative spark. What inspires your own creativity? Sustainability and reuse. If I can give something a new life through stitch or print that excites me. Tell us about a learning curve/challenging lesson you have learnt in your area of expertise, and how you overcame it. My biggest challenge of the past two years has been to allow myself to stop and recharge and not to put so much pressure on myself creativity. I have been on a hiatus of late as my ‘real’ job is all consuming and finding the time and passion to create something new is impossible. I used to really knock myself out about that but making work just for the sake of selling it is not where my heart lies. I want to be an inventive and innovative maker so at the moment I live vicariously through my students. We often learn together and our young people are where innovation lies. How does your class teach people something new/why are you teaching? I like to think my classes show people alternative ways to combine materials, patterns and textures. I teach because I get immense satisfaction from sharing my knowledge. The pleasure people get from completing a project is infectious. What is a tool your own tool-kit is never without. A camera and a notebook. If you could learn from anyone in the world, who would it be, what would you make and why? I would go back in time and sit with my grandmother and have her teach me to embroider again. I didn’t appreciate it enough the first time around. I have taught at Handmade for five years now and it really holds a very special place in my heart. Handmade is not just about the workshops, it is about a community of people coming together and sharing their stories. Too few opportunities exist in our busy lives for us to engage in new learning and take some time to revisit old skills. Handmade allows people to reconnect with their inquiring and creative selves. It’s not necessarily about the finished ‘thing’ its more about the process and the whole experience. Where in Wellington would you say inspires you to make something unique? Just the energy of the city is inspiring, there is no one place for me- it is the culture of our capital. The wind, architecture, people, food, noise and light. I leave Wellington on a creative high every time. Do you have any last creative words to inspire us all? If you have a garden and a library you have everything you need. Cicero. 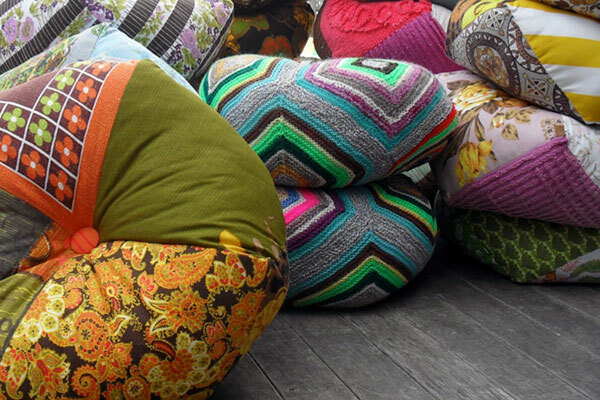 Book a spot with Jo and Jess in their workshop, Hexagonal Fattie Cushion, Sat 30 May, 2pm.